Applied behavioural psychology in the world of User Experience (UX) occasionally strays into conversations about ethics. As persuasionists, is it right that we design interactions that part people with their money ever-more effectively? Most of us can robustly defend this work as part of a layered approach to the natural consumer behaviour of mature economies. There are, naturally, products and services many of us feel uncomfortable supporting with our work. Personally, two of my red lines are gambling and payday loans. It will not surprise you then to know I did not mourn the news that Wonga is in significant financial difficulty. The previously-feted company saw itself as a technology provider first and financial service provided second – much has been made of their skill in the former that led to success in the latter. Wonga is a powerful example of the deployment of many pieces of behavioural design, working together. Firstly, marketing to vulnerable segments, then underplaying the interest rates, using infantile creative that trivialised moderation, and their addictive user interface was just one part of that. That interface meant reduced friction, making it unbelievably easy for the distressed consumer to request instant cash. They let you see what you could get and then applied insufficient background checks, which meant that, in most cases, you got what you asked for. This played to two very damaging real-world situations: the ability to re-float a betting habit, and payday panic (running out of cash before salaries or benefits are paid). In neither of those examples would anyone suggest that issuing 5,000% APR loans would help and that the situation would not sufficiently improve by the next cycle that said obscenely high-interest loan would not actually deepen the problem. Thus Wonga’s irresponsible lending criteria (discussed at length in a brilliantly detailed tear-down by Dominic Lindley) was married to the very worst example of addictive interface design. Mourning the inevitable demise of Wonga is not something Martin Lewis is keen on either, and in his comments on the subject he also raises the observation that a national financial illiteracy had a role in providing the fertile conditions for irresponsible lending to take hold. It’s a very worthwhile point and important also to remember that this applies as much to the ignorance of saving and investing as it does to the lure of easy credit. In that regard whilst I take no pleasure in the possibility that good people will be made redundant from the UX and design teams at Wonga, I would suggest that they promote themselves to the investment industry. Much has been achieved in making microsaving and investing more effortless through technology, product design and marketing, but there is always more that can be done. It might be a far-fetched scenario but if the suggestible young professional can be duly coerced into upping their pension contributions after a heavy night on the tiles whilst watching late night TV then perhaps those skills won’t be wasted. Several years ago the government wanted everyone to replace their loft insulation with more efficient stuff. They subsidised it so heavily it made absolute economic sense. But, proportionally, few people did it. Why? The reason was that clearing your loft was a colossal arse-ache. The problem was not one of economics, it was one of domestic logistics. Anyone doing the math(s) can see that running an electric vehicle makes sense. Heavily subsidised and low running costs (by almost every measure) but take up will be hampered because of logistics. Consider this quote from a recent Top Gear article based on the UK infrastructure: “To charge an EV on the road, you need to be a member of several different schemes, with opaque pricing. Some allow you to turn up and go, some want to send you an RFID key in the post, some will allow you to use an app. Some demand an up-front membership fee. In [the author’s own] borough of Islington, you have to prove you own the car and prove you live there before you can use the on-street posts. So I can’t because I don’t own the Jag. So right now the EV market is tough because the government won’t help people clear their lofts. Time for an update to my little experiment in Pound Cost Averaging (PCA) and a modified version of this investment strategy which, as you will recall, invests more aggressively in a falling market and more cautiously in a rising market. My last update was 6 months ago. When I started this experiment the FTSE was at 6903 points, on 1st August it was 7424. A rise of 7.54%. Using my modified PCA my ROI is 9.1% which is marginally outperforming a basic PCA and both are out performing the FTSE. The (rounded to the pound) figures show a pretty close match. I’m surprised that the modified PCA hasn’t really pushed up the growth but in truth the market has been +ve in 11 months and –ve in 9 months so it’s really not seen the kind of prolonged rises and falls that might change this more. I’ve also had some thoughts that if generally the market rises then a strategy which ultimately backs-off on the inclines to the same degree it goes hard on the declines is always going to struggle to beat the average! So, at the end of the year I’m going to tinker with the modifier and go harder on the downhills. In any event, if you’d put the same investment in a cash ISA over this period, well you’d have about £30. How Dare looked in 2008, 13-14 Margaret Street, when I joined. Of the many anecdotes I use to colour my conversations at Dare, one I have repeated a good few times is that I didn’t know what planning was when I interviewed to join the planning team. My interviews with Mark Bell and the venerable John Owen confirmed to me that planning seemed an interesting home for my then-discipline of Information Architecture. 9 years down the line I leave Dare this week having helped develop a new discipline in Experience Planning and to define a skill set and methodology that is admired by our peers and directly responsible for some remarkable behaviour change stories and commercial returns. Knowing so little back then about agency life and the heritage of Dare and its DNA embarrasses me in hindsight, but it’s not unique. Reading Jeremy’s last post at BBH Labs it’s apparent that going in green isn’t such a bad thing. Dare’s recruitment policy was once summed up as being about finding people who were Good and Nice. It didn’t always work out that way, of course, but the overwhelming majority of people that walked through the doors at Great Titchfield Street, New Cavendish Street and recently at Tabernacle and Rosebery Avenue, have been the kind of talent you enjoy working with and learn quickly from. I hope, in some way, I’ve paid it back along the way. Dare’s new direction, a direction I co-authored in December 2016 is absolutely right for its continued success. As Digital Design Engineers I am convinced that clients, press, partners, and employees will be talking about some exceptional work coming out of the 4th floor in the months to come. Work which, I’m proud to say, will have started its life in the research, analysis and creative applied-psychology of the Experience Planning team I leave behind; a team now solely in the immensely capable charge of Roz Thomas and, once again, Mark. In the first years of my time at Dare we made banners and microsites, ideas that worked. We told the story of BMW’s efficient dynamics, Jonny Watson and Dan Harrison showed the world the capability of Bravia TV through the missions of James Bond, deployed a roving LiveGuy for Vodafone when 3G was barely a thing we. Gavin Bell and a swelling social planning team pumped up space hoppers with tweets for Sony Ericsson. Mark Hastings and I changed the way people bought investments with Standard Life, Rob & Dip created the world’s most successful branded app – for a while most Americans thought Barclaycard made waterslide games. Times changed and we grew hard and fast, site builds got bigger: Premier Inn, Sony Ericsson. These weren’t £20k campaigns they were major Ux and design jobs. We went after ATL work, we developed apps for London 2012, Race for Life, Stephen Fry and Jeremy Clarkson. TV ads started coming out for PHE, powered by smart behaviour thinking from the likes of Nick Hirst or Go Compare with Andy Nairn’s noble but controversial attempt to kill off Gio. More changes in ownership and leadership, the dawning realisation that the mergers weren’t bearing fruit and some sterling work still came out of the shop. Suddenly we’re knee deep in site re-architecture and builds for Post Office, EE, Investec, Aviva. Digital transformation and Experience Planning defined the agency in the pre-Oliver era and the pitches rolled in week after week all seeking the same transformative digital thinking. 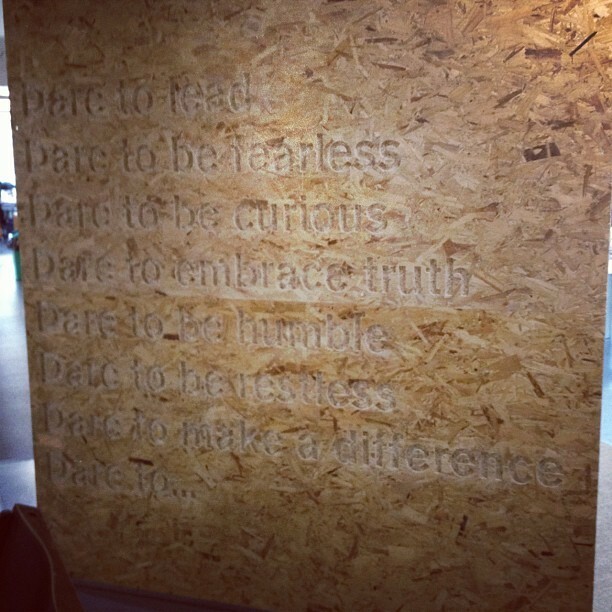 In the Oliver era, Dare continues to deliver for Hakkasan, parkrun, Barclays, Nike, EE, Vision Express. 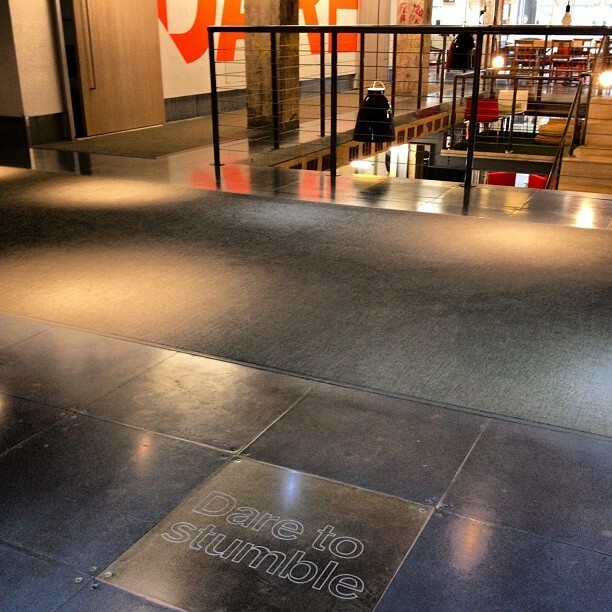 Along the way sure we misfired with countless strategic visions and too many misguided pitches, we etched our values into OSB wall panels and floor tiles but couldn’t always get our investors, staff or the press to believe it. In truth, what made Dare the kind of place I stayed at for 9 years was not written on the floor or presented at the end of year reviews. It was everything we did together in work, in the pub, on email lists, and in the parks, cafes, restaurants, trains, taxis and planes to client offices. Almost every moment was great, or if it wasn’t fun it was purposeful, intelligent, creative and we held each other to the same exacting standards. It was, it is, 3PF, Dare Run, The Gavins, Dare Folk, The Nook at Dare, The Lukin, the Ship, Knowing Me Knowing You, Dare FC, First Thursday, The Pipe and Slippers, The Crow’s Nest. I stayed late many many nights. I watched designers work and rework their designs to be as sharp as a pin. I wrote and rewrote deck after deck until it felt perfect. I tested, tweaked and fettled with developers and our experience team to make interfaces that felt effortless, exciting and memorable. In my last weeks at Dare I worked with as talented and energetic a team as any I have done, a team in the new era that’s even leaner, better equipped and faster. A team of perfectionists with a work ethic that saw us deliver a suite of user experience documentation, functional specifications and remarkable designs that prove that, right now, there are few places capable of the kind of quality and thinking that Dare produces at its best. Still over 2 years away from relinquishing their ‘Digital Agency of the Decade‘ title, I wouldn’t be in the least bit embarrassed at continuing to trade on that heritage whilst having considerable confidence that there is, under Michael Olaye’s watch, plenty more great work to come. Mark Collier, John Bartle and Board and management team variously including Lee Wright, Leigh Thomas, John Owen, Toby Horry, Claire Hynes, Gal Bell, Nadya Powell, Stephen Morgan, Richard Neish, Fergus Adam, Jamal Cassim, Perninder Dhadwar, Mark Cramphorn. A creative, copywriting and design heritage exemplified by Flo Heiss, Laura J-B, Suki Rai, Ben Lloyd, Steve Whittington, James Warfield, Dan Viveros, Dennis Christensen, Ron Siemerink, Michelle Charlton, Dan Bray, Kerry Roper, Charlie Phipps, Matt Firth, Kit Hoang, Jonny Goodall, Luke Stenzhorn, Matt Henry, Mark Gardner, Matt Bolton, Stuart Peddie, Vass Alexiou, Ian Fooks, Eduardo, Kit Suman, Pat McCaren, Jon Long, Emma Lawson, Carina Martin, Nicky P, Rammo, J-P, Matt, Jake & Ig, Woods and H’Bone, Watson & Harrison, Rob & Dip, Fergus Jackson, Spike & Steve. HR and support from Kim Woolner, Lou Jackson, Natalie Chomin, Gemma Popejoy, Harry P, Keith, Emily Macfarlane, Stuart Martin, Rebecca Owen, Marni, Kate Campbell, Jonathan Williams, Belinda. Client management tekkers from Leigh and Nadya, Liza Durge, Al Bowers, Matt Law, Rebecca Saunders, Jamal Cassim, Josh Harris, Mizzy Lees, Emma Bennett, Asa Skogstrom, Mark Hastings, Muscles, Lucy Doubleday, Rox, Gav Bell, Mark Evans, Melis Ongun, Alex Smith, Lexi Cherniavsky, Ruth Feltham, Katherine Lathwell, Vanessa Juby, Nathan McKean, Hannah Hilbery, Elizabeth Butterworth, Tamara Bennett, CJT, Mel Parris, Alanna Southgate, Mark Beesley, Liza Wostman, Lee McGuffie, Rohan Nayee. And finally, my faultless Experience Planners. Roz Thomas, Anna Dahlstrom, Tom Harle, Paul Mason, Julia Dean, Tom Belt, Sam Belt, Jack Payne, Fred Gulliford, Natalie King, Sabrina Laxmanalal, Martina Costello, Richard Blair, Aarti Dodhia, Conor Fallon, Hannah Mearns, Kate Redfern, Isabel Perry, Rachel Jones, Naomi Desalegene, Alex Musson, Phil Verheul, Tom Saldanha, Rachel Farrar, Vanita Tanna, Payal Mithani Every single one of which I would happily work with again. As Jurassic Park rolls into Toto’s Africa and I pack away my Uncle Joe’s mint balls and china bull I’ll stop reading this chapter, because until I do, I’ll not start my next. Some of these visuals by Flo. Apologies to anyone I’ve missed. In 9 years I have worked with several hundred of you, forgive me if my recall game is not strong! Espresso Ideas: Why we should celebrate the art of the small in behaviour change. I’m fortunate in my role to have worked alongside some very smart ad and communications folk. I’ve worked in an agency that, at times, created incredible award-winning TV ads, behaviour change programmes and entire digital transformations. I’ve never been dismissive of the pursuit of a Big Idea in creative agencies. A researched and planned bit of single minded creative communications that might appear to have developed in a spontaneous eruption from the creative crucible following client and agency briefings. It’s identifiable, expansive and almost certainly expensive. It’s piercing, distinct, emotionally resonant and hopefully award winning. Big Ideas are the consequence of a remarkably intransigent perception that big problems require big budgets and big messaging, it is – to an extent – why a President who sees a problem of the scale of immigration assumes the solution is a $15bn wall. My interest in the psychology of behaviour and persuasive experience design however has found me happiest working with the small-but powerful idea, hereafter the Espresso Idea. In a recent piece in The Drum my colleague, Mark Bell (following his guest editorship of the APG) lamented the lack of progress in getting traction with Behavioural Economics and I’d add that this is, in part at least, down to the fact that much of what we do appears anecdotal, parochial – trivial. The fact is that many of these interventions are incredibly minor in execution but the change they create can be profound. Ergo, not trivial at all. What we’re really not good at is celebrating the effects. Now that’s the kind of neat, concentrated and efficient idea I like and – as you can see – one that benefits the customer. There are loads of these kinds of stories and partly we’re at fault in the industry for relying on such anecdotes, particularly as they often seem so anchored in the specific context. Take Rory’s example from Nudgestock in 2015, he mentioned that a Fire Safety team (somewhere in the US) were trying to get more people to install the three free smoke detectors they were being offered. A Big Idea would have involved some sort of comms push: leaflets, fire engine adverts, posters, local TV, radio broadcasts. No-one could understand why people were only ever taking up one of three free detectors when the Fire Service came to call. The Espresso Idea was to turn up instead with six. Residents felt ok at refusing six but were more happy to have three installed. A tiny change in reframing the offer resulted in hundreds if not thousands of extra detectors being fitted. It’s a great story, its a great idea but it’s easy to dismiss as applicable only in that context. For a while I would present talks on behaviour change with a series of slides titled “Have you heard the one about…” which would include a quick-fire playback of everything from tax return envelope testing, undergraduate vaccination programmes, stale popcorn, loft insulation, organ donation, sat nags with children voices near schools and flies in urinals. The smallest of these nudges are regularly and neatly captured these days on twitter under the useful #nudgesinthewild. What this serves to do is show that there are many many contexts for creativity based on behavioural principles. To achieve this, some have become lazy, relying on heuristics and posterised lists of cognitive biases. It’s an irony that whilst I advocate a celebration of the parsimonious in execution, I am troubled by the over simplification of the psychology that underpins their success. These are biases that have been discovered (or at least better understood) through decades of detailed research. By all means use the codexes as your starting point but if you’re to use them in substantiation, you’d better be prepared to read the evidence and research and test your solution. So whilst I urge the development of more creativity and ingenuity in smart small ideas, I’d do so with the strong desire to see this informed and led by practitioners prepared to research, test and defend their work with empirical rigour. Fortunately, in digital at least, we have a fantastic opportunity to explore the Espresso Idea at great speed and at considerable scale. We are, perhaps uniquely placed to deploy changes in processes, wordings, layout and visual cues. The reordering of a transactional flow, a multivariate test of a comparison table or the addition of some persuasive or helpful microcopy can effect the kinds of changes that previously might have taken months to achieve. Of course one must earn the right to this kind of intervention and convincing the keyholders of content and customer journeys of your hypothesis can surely be more successfully achieved if done with the kind of research and substantiation mentioned above. Ultimately, as experience design professionals, our calling card benefits from the celebration of successful design interventions. At Cannes there is an unashamed veneration of the craft of advertising; at the EFEs it is the consequences of advertising that are awarded, again at scale. I’d like to see both these events take more notice of this fascinating intersection where creative ideas and effective behaviour design overlap and produce the kinds of concentrated, caffeinated results that typify small effort, Espresso Ideas. Digital denies the past. Why do we ignore nostalgia and context online? Despite architecture being a common sight in the nomenclature of digital user experience design, it’s rare that I come across practitioners in my field of human-centred design that take either inspiration or education from the work of our cousins designing in the built environment. For some six years now I’ve had it in mind to call out this naivety and invite discussion about what this means in our profession. I can say 6 years (nearly 7) because that’s how long ago it was since Kevin McCloud gave the RIBA Trust Annual Lecture [available on Vimeo]. It’s a lecture that has stuck in my mind all this time for how vividly he discussed the role of context in architecture, it was a concept so profoundly lacking in digital (information/user experience) architecture in 2010 and is still absent today. If I may, I’d invite you at this point to think about the possessions in your life. A notebook you might use, a leather chair. A favourite pair of jeans, even the scuffed and aged treads on your stairs, a jewellery box, garden tools or a suitcase battered from a hundred baggage carousels. Items like these appreciate in value as they age. Maybe not monetarily (though this is certainly true in some cases) but certainly in what they mean to us. Even functionally, we like things that have broken-in in some sense, that have a well worn but reliable behaviour. Contrast this with the technology in your life. From the unboxing onward our digital products are perceived on a downwards trajectory. A dented corner, a cracked screen, these are items that deteriorate, not patinate. Even when their functionality is, like the well-worn chair, intact, we care so little for them that we’ll seal them in cellophane and ship them off for a paltry cashback or simply dump them unceremoniously. Truthfully these are places and products within which we will have spent considerable time and invested equal parts emotion. It might be the phone you made a life changing call on, a camera you took a defining photograph with, a piece of software on which you designed or listened to something personal or profound. In both a literal and figurative sense, digital does have memory – arguably more so than those battered jeans. I fully appreciate I paint with broad strokes here: a pair of marathon-worn shoes are sentimental to one, a scrap-heap invitation to buy new ones to another, but if you accept the general premise that we have a distorted value of history in digital then we might move to consider our online experiences. Scuffs, turned corners and finger marks tell a story, adding context and value. The artist William Morris founded the Society for the Preservation of Ancient Buildings in 1877 because he saw a future where our architectural heritage was being swept aside or clumsily restored, asserting as he did that “As good buildings age, the bond with their sites strengthens. A beautiful, interesting or simply ancient building still belongs where it stands however corrupted that place may have become. Use and adaptation of buildings leave their marks and these, in time, we also see as aspects of the building’s integrity.” We acknowledge the contribution made by the barn, the guildhall, the corn exchange, the coaching inn, the gate house, the packhorse bridge. We preserve in aspic (how needlessly pejorative that term has become!) that which we feel defines the context of our environment. Our towns, cities, villages and streets are rich with the complex layers of history and the people who have moved through them. This complexity adds depth, regardless of your penchant for steel and glass, thatched roofs or Georgian symmetry. What could be more empathetic and ‘user-centred’ than the streets of downtown Boston, a layout that owes its muddled honesty to the movement of cattle to pasture? We do not appear to have carried this through to our digital age; least, not to anything like the same degree. In the digital arena, there is no surprise when designers and planners are asked to redesign a complete experience from scratch, tabula rasa. Briefs are rich with all-encompassing disdain for the current site, products or applications. Even when the scope does not extend as far as a full teardown, even the discrete and specific jobs are almost exclusively seeking to retain little to nothing of the incumbent. Furthermore, these briefs are so intent on the new that the presentation of historic context is done so only to tell the team what is not wanted. Digital is throwaway. A significant part of the 6-year delay in writing this post has been in my nagging feeling that there’s a really good reason why the analogy (and therefore the nexus between the two types of architecture) is broken, that I’m missing a really obvious point as to why we design digerati behave in such a way. I’ll start with technology here. Technology depreciates in a way in which buildings don’t. Sure, materials deteriorate and, over time, things will break but, in simple terms, when someone creates a new way of opening a door, it doesn’t stop the door at your house from working. Standards in construction have changed, you can’t get sign-off for 1930s electrical wiring, for example, and modernisation for safety and future compatibility is essential, as it is online. Backwards compatibility and more mature approach to obsolescence in code can still draw strong parallels in architecture. A stonemason can still use centuries-old techniques to join a crumbling facade to a new building, a joiner can restore a timber framed barn with spliced green oak. Equally, there could be is a requirement for skilled artisans of deprecated languages to develop for our digital realms. What of design and aesthetics? We might improve functionally on an Elizabethan window, however, it’s not inconceivable, in fact, it’s more often than not the case, that we retain them in spite of their limitations, for their aesthetic and – I can’t stress this enough – for how they make us feel. In doing away with what love (however clouded in nostalgia) and in undervaluing these intangible feelings, we risk marching robotically to a banal and derivative digital world where we find little more than emotionless efficiency. Donald Norman’s Emotional Design is approaching 13 years old and I profoundly wish more designers paid attention to the visceral and reflective elements of design whilst they rush to tell us about their behaviour-led approach. In simple terms I want us to throw away less of our digital heritage. I want to provoke a conversation (if not a debate) about how we might make use of that which adds texture and heritage to our online experiences. Nevertheless, what are the interactions, the patterns and structures that we could preserve and incorporate in the new? Where are the echoes of past behaviours and the people that use our sites? What are the iconic, seminal elements that define the brands and places we interact with? It might be the Google search box, the Daily Mail‘s ‘sidebar of shame’, the iconography of Airbnb. To be clear, this is not about archiving and preservation. It’s not archive.org or slideshows of interfaces gone by, this is living history, contextual inspiration and the fusing of interesting, beautiful and usable experiences within the inexorable desire to create in platforms and devices. To return to the physical world, fair criticism might be levelled at our low-effort veneration of our architectural past. A cursory drive around the suburbs of Britain is all it takes to see clumsy pastiches of architectural epochs, anachronistic conceits like bricked-up windows, fake chimneys, concrete ‘Kent peg’ tiles, Doric columns. There’s no accounting for taste nor the application of contextual consideration in new design. However, our built environments are governed in a way digital is not, we have town planners and conservationists, we have some keen to retain a facade, others to slavishly recreate the past, at great scale. There is no corresponding planning authority or Grade Listing for our online environments and the risks of aesthetic carnage are even greater online as the barrier to entry as a designer is lower than that of the architect. Misguided design decisions, the lack of guardianship and our human nature to seek the path of least resistance will naturally tempt many to simply copy and produce uncanny replicas akin to a Tudor mansion in a Chinese town. Our only defence is the financial, as digital environments get ever more complex and integrated the cost of a clean slate becomes that little bit harder to justify but only so long as those involved still have skin in the game. The rapid turnover of staff often means that there is a happy corporate amnesia for such historic investments. I have spent a large part of the past few months working on a full redesign of parkrun and, in the coming months, this site will launch into a community of runners and volunteers many of whom will be intimately familiar with a site that has been in place for many years. It’s a site that, although aged and with many idiosyncrasies, is much loved and efficient for those familiar with it. It’s been a fundamental part of the work undertaken by Dare’s Experience Planning (UX), Design and Engineering teams to understand what of those experiences must be maintained and how they might be upgraded without losing the soul and efficiency of the previous incarnation. Perhaps it is in the physicality of our future digital environment that we will finally see the blend of old and new. It’s taken 7 years and the maturation of technology like Alexa and Siri, an ecosystem rich in connected devices and applications to get to a point where I feel comfortable in painting a picture of a world where our familiar objects age through the hybridisation of technology: a classic car with voice activated navigation, our photo albums with face recognition a much-loved HiFi bridged to every piece of music ever written. I can’t help feeling this isn’t quite enough, however, and in time our future selves will look back with disdain at our wilful ignorance and disdain for the earliest efforts of our architects and artisans in creating places for us to live, work and play. Thorington Hall, Suffolk, demolished 1949. Image: Tiger Aspect Productions & Lost Heritage. I found myself listening to Sir Roy Strong’s Desert Island Discs recently on a long, contemplative walk in the hills, I wonder if we need our own digital version of the Destruction of the Country House, the most obvious response to which would be to dismiss our digital heritage as being the rudimentary experiments of an immature industry, quite unlike the grand country houses Sir Roy was drawing the nation’s attention to at the V&A in 1974. That may be so, but I cannot help but feel we have all too easily ignored both the lessons of our architectural purges and the powerful role that context and nostalgia play in enhancing and making sense of our digital lives. As this excellent piece by Matthew Beckett notes, the Destruction exhibition was part of a chain of such as the Gowers Report on Historic Houses, Grade listings and the frameworks for appreciation and preservation that ensure we are rightly forced to think of heritage in the built environment. This chain started post-WW2, an environment where, much like today, the forces of a desire for innovation, optimism and the new were in conflict with those who didn’t see the sense in flattening everything the Luftwaffe hadn’t had the opportunity to finish off. Here then is one great opportunity to apply lessons from the past, reusing code, visual design, tone of voice or interactions. We should, for example, be unafraid of whimsical skeuomorphic elements that connect us through shared memories and learned behaviours. Although it’s not easy to conceive of how, I’m inspired by the portfolio of reuse on Dezeen and how this might lead us to reimagine old digital devices and experiences in new ways. The success of The Design Museum’s celebration of the construction and relocation-to the former Commonwealth Institute is inspiring. And that’s ultimately all this post is intended to be, an opportunity to provoke and inspire conversation of what it is to value context and nostalgia in digital, to think less about purges and redesigns and more in terms of work that responds to and reflects the experience of the people that built it and use it. On the 1st April Kara Pernice wrote a satirical piece on the NN/g blog calling on the user-centred design community to switch to creating difficult designs, for the benefit of humanity. I’m sure it was a jolly April Fool for the NN/g to post such an about-turn but in truth there is much we could do to reduce our obsession with making things easier for customers, listening to their every whim and generally ignoring the realities of human existence in our pursuit of the utopian user experience. I’ve written and spoken several times about intentional friction. It’s something I passionately believe in. From the smallest poke-a-yoke to the intentional deployment of dark patterns, there is a place for cognitive – even dexterity challenges – in user experience (see William Peng’s post on sign ups) and to deny them is to apply flat earth thinking to our behaviours. In user centred design we have to believe that the user is, by definition, a sacred cow. I’d contend that, although the entire herd are not for the abattoir, we should at least consider some tactical ignorance. In my second piece on the subject, I will be exploring what it really means to listen to users and not resort to the tropes bandied around by a lazy community of precocious experts.